NOTE: THIS SHOW 15+ OK IF ACCOMPANIED BY A GUARDIAN or PARENT. 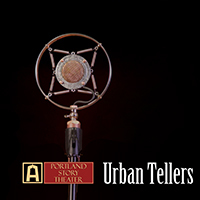 Every month, a group of six people come together as Urban Tellers® to stand and deliver the real, true stories that they have discovered, crafted, and honed in Portland Story Theater’s Art of Personal Narrative workshops. The results are highly personal and authentic narratives. This time we’re partnering with PlayWrite, Inc.’s leadership program for this month’s program. You might hear stories about difficult choices, transformational life experiences, or hilarious family interactions. Join us. We expect the results to be authentic, funny and fearless. Present your Oregon Trail Card at the door. Portland Story Theater participates in the Arts for All PDX program, which allows holders of the Oregon Trail Card to buy tickets for a reduced price of $5 each..